A published author (humour & children’s books) who ventured into the business world, Sathya now heads Jigsaw Academy’s Corporate training business. Her story telling skills helped her through a career in Marketing, Product, Sales and Business Development. 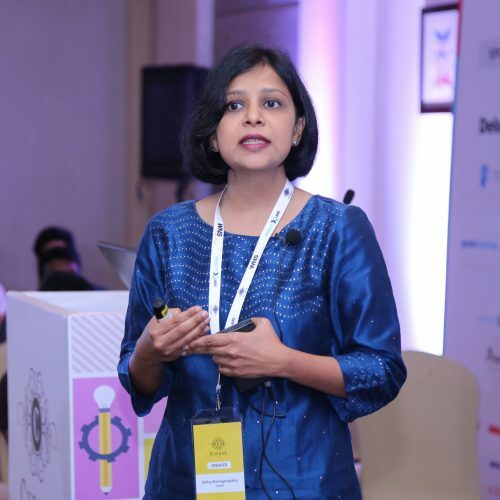 Sathya has worked in multiple industries including Media, Recruitment, Training; during which the self-confessed “non-quant” in her learned to deal with all kinds of Analytics & Numbers in business. Sathya is now passionate about equipping every business executive with the exact level of Analytics knowledge they need in their careers; without making them feel they are writing IIT- JEE again. The last few years have seen an explosion in the growth of data. As companies begin to rely more and more on analytics, it is essential that everyone in the organization learns to speak the same language - the language of data. This session explores what it means for an organization to be truly "data smart". It addresses the notion that analytics is not a niche skill for a select few. Rather it is a skill that needs to be embedded within the DNA of the organization where everyone, from the entry level executive to the C suite, needs to understand and respect the power of data and analytics.